We had a wonderful time showing We See Fireworks in Edinburgh at the wonderfully eccentric and welcoming Museum of Edinburgh. Closeted in the upper most part of the 17th Century building we filled our beautiful Lecture Room space with flickering light and ghosted voices as over 600 people visited the installation to surround themselves with remembered performative encounters. We even had some reviewers take the trip along Canongate to visit us, read what The Herald and Three Weeks had to say...! Our lightbulbs are now being carefully bubble-wrapped and shipped off to Grenswerk 11 in the Netherlands for a run from the 25 September to 2 October 2011. 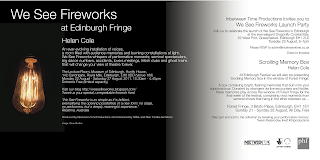 We will also be presenting the new film work of We See Fireworks as part of the Australian Theatre Forum 2011 from 14 - 16 September at Brisbane Powerhouse. Upon entering the room, lit by faded iridescent light bulbs, you instantly find yourself embedded inside someone else’s vibrant reminiscence; ‘We See Fireworks’ is an unimaginable, enchanting collection of precious and personal memoirs. All 300 voices welcome the listener, to share their story, which is extremely moving as they are often private or once-in-a-lifetime experiences. 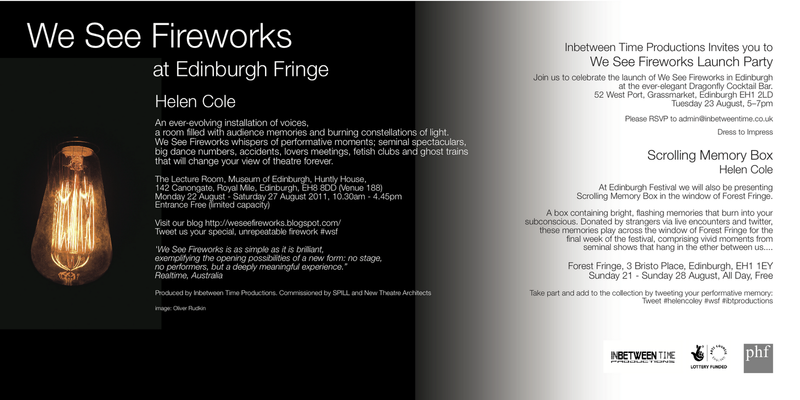 All the memories relate to theatre and explore the idea of ‘performance’ and how people relate to it. The glowing and fading light bulbs become mesmerising, as you listen to stories of love, fear, woe, hope, longing and contentment. Then they fade and you are left in darkness with other people’s experiences lingering around you. A truly unique, inspirational and poignant piece of work. I think it was this year. I had to go and see my girlfriend to say I was going to be late home. I was in an enclosed space with a piano and a kind of upside down barber’s mirror. It was a really interesting space. Anyway I was talking, and they kind of closed the space, and I was stuck in there. And I really did not have any time for live art. I really did not have any time for it at all. I wanted to leave, but I had to stay because it was disrespectful to leave the performance. And it was stunning. This guy came in and he moved the full weight of the piano onto himself, and played this gorgeous song. It was quite pointed, not an ‘oh-I-love-you’ song, but an ‘I-am-going-to-miss-you-but-I-will-be-fine’ sort of thing. The piano was really heavy, and it seemed to be crushing him, and there seemed to be this kind of struggle that was coming from him holding the piano. But the struggle gave the song much more poignancy. It was actually really positive and uplifting, and I felt desperately privileged to be there. It was beautiful, and I think that for about 3 days, maybe a bit more, the performance was my first thought. It just stayed with me, especially the song. It inspired me to move on. He really got deep inside me. It showed his strength, to hold this piano up. Like it was right on top of him. Every sinew in his body was stretched to the limit, and he had to pause between lines to get his breath back and to sing. I have never forgotten it.